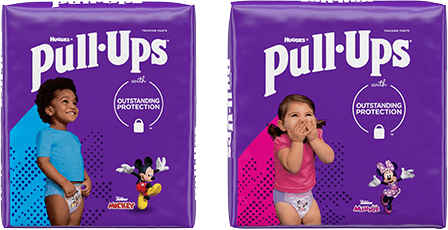 Due to Puppies’ agreeable natures, they are likely to be on board whenever you decide to introduce Pull-Ups®. Puppies will be interested in this stage and raring to get started. Part of creating a positive emotional experience for your Puppy is being in tune with her. Puppies are programmed to seek approval, and look to their parents for confirmation that they are doing the right thing in the right way. Let them know what to do, and praise them when they do it! Whenever you’re able, take your Puppy to the bathroom with you. This potty training process is a partnership. When you’re in the store, you can discuss the various Disney characters, weighing which one your Puppy wants to try out first. “Pull-Ups will help you put your pee and poop in the potty just like a Big Kid [or name of sibling/cousin]." Once you’re home, let your Puppy try on her new Pull-Ups. Maybe she’d like to model them for friends or have a little fashion show for you. Offer lots of positive encouragement. “How do they look in the mirror?” Let your Puppy know that her favorite Pull-Ups character is keeping her company while she learns about going to the potty. You can experiment with the different types of Pull-Ups to see which ones work best for your child. Learning Designs® have pictures that fade when wet to help your Puppy learn to stay dry. Pull-Ups® Cool & Learn® provides a brief cooling sensation when your child wets to help you teach her the signs of when she needs to go. Connect with your Puppy by reading a book or singing a song when he is on the potty. You can even make up your own silly potty stories about the characters on his new Pull-Ups. Be creative in your story telling, and encourage your Puppy to be creative, too. Silly potty stories go a long way to motivate and engage your toddler, and laughing builds the feeling of being in this process together. Encourage your Puppy to use dramatic play in the bathroom, too. A stuffed animal or doll can wear Pull-Ups and go through the potty steps, with your child directing all the action and “teaching” his special friend how to be potty trained. Let your Puppy join in the fun by selecting which Pull-Ups designs to wear first. When your child sees the change on the Learning Designs picture or feels that his Cool & Learn is wet, count that as a win – celebrate it with a song, high five or silly dance. For Puppies, success builds on success, especially when you add in encouragement. Potty training is a big moment – it’s when your little one becomes a big kid. So it’s important to reinforce this change, and there are a couple easy ways to do so. First, be consistent. When you take your kid out of diapers, keep her out of diapers. Pull Ups are more than a training pant. They’re also a symbol to your little one that it’s time to potty like a Big Kid. Going back and forth from diapers to pants only confuses her. Next, make the first time she pulls on a pair of Pull-Ups a symbol — a promise that you’re in it together and will work and learn together on your potty training journey.